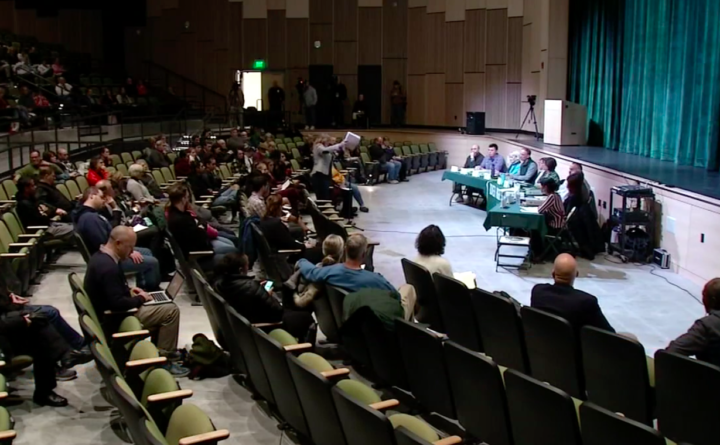 About 100 people turned out to the Dover, New Hampshire, School Board meeting Monday night after video surfaced of two local students singing "Jingle Bells" with Ku Klux Klan lyrics. John Carver, the teacher who led the class at Dover High School, has been placed on paid administrative leave. Some people who attended the meeting Monday called for Carver to be fired, while others said he should be reinstated. WMUR-TV reports one of Carver’s sons spoke at the meeting, saying his dad has made a positive impact on everyone around him. Dover Superintendent William Harbron said last week that the incident was part of a class assignment in American history. The Dover School Board says it will not discuss the incident until an investigation is complete.